The bay provides a spectacular backdrop to a charming collection of specialty shops, art galleries and restaurants. Originally known as the old Ferry Landing, visitors and locals alike come to enjoy the palm-lined pathways and open-air amusements. Whether you’re hungry for fresh seafood or California cuisine, there’s a variety of fine dining and casual eateries to choose from. Spend some time at the waterfront park to fish off the pier, relax in the grass, or build a sand castle at the beach. Or you can just lounge under a tree and watch as the many different boats travel in and out of the bay. If you happen to be around on a Tuesday afternoon, be sure to stroll through the Coronado Farmer’s Market featuring fresh fruits and vegetables from local growers. Rent a bike and explore the area and stop in at the various gift shops for all sorts of unique items and souvenirs. Just across the Big Bay from downtown San Diego, Coronado Island beckons visitors with its pristine beaches, crystal waters and friendly beach town persona. It’s here that the historic Hotel Del Coronado has been luring guests since 1888 and where those with an affinity for the beach, the ocean, fine food and eclectic shops gather to relish in its delightful amenities. The Coronado Museum of History and Art is a place to discover the rich and unique history of Coronado. Through a variety of permanent exhibits and changing displays, the museum offers guests an up close look at the art, architecture, and historical resources of Coronado’s past. Within its galleries, the Coronado Museum of History and Art is home to two permanent exhibits including an extensive collection of art and photographs that showcases life on Coronado since the 1880s. Also included are photographs, original objects, early bathing costumes and women’s dresses from the era of Tent City which operated from 1900 to 1939. Other special exhibits include the History of U.S. Navy Seals in Coronado. A wonderful way to appreciate the magnificent views of the island, the Coronado Cruise Bike Tour offers fun and adventure for everyone ages 12 and up. This 10-mile ride takes you under the Coronado Bridge, past the historic Hotel del Coronado and allows you to see many other picturesque spots. The entire tour is along bike friendly, flat terrain making it a relaxing ride. Paddle your way beneath the beautiful Coronado Bridge and explore the many sights that make the San Diego Bay so special. This unique kayak tour is great for adults, children and families, allowing you to view such popular sites as Petco Park, the Embarcadero, the USS Midway, Naval Station Island, the Silver Strand and more. One of the newest and most fun ways to get in the water, stand up paddle boarding is a great way to enjoy Coronado Island. Rent a paddleboard and give it a try while you enjoy the majestic vistas from the San Diego Bay. The Coronado Tree Tour is a pleasant walk through the island’s Spreckles Park. Feel the cool breeze while learning about the magnificent trees, flora and fauna that make this park so extraordinary. Your guide, a local arborist, will share interesting facts and history about Coronado and how and why trees came to the region. Hop on a segway and glide around the island while exploring its many gems. Enjoy seeing the sights while learning about them from a knowledgeable guide. You’ll be transported to The Gaslamp Quarter and Bayfront, down the many charming streets to view the unique homes and past Embarcadero. Many photo opportunities present themselves as you enjoy this 1.5 hour tour. Known for its gorgeous beaches, Coronado Island offers a plethora of choices for fun in the sun. There are five white sand havens on the island including Coronado Central Beach, Coronado Dog Beach, Glorietta Bay Beach, Silver Strand State Beach and the Ferry Landing Marketplace. 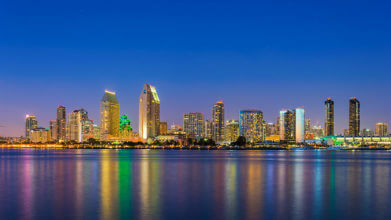 Each has its own unique personality and all provide a perfect way to enjoy the magnificent San Diego climate. 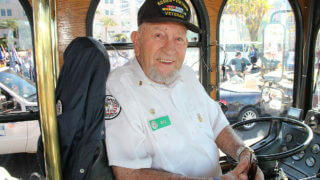 Old Town Trolley is a convenient way to explore The Coronado Hotel while maximizing your vacation time. There are precious few beachfront resorts that can outclass this Victorian-style masterpiece. For 120 years, the Hotel del Coronado has been enchanting guests and celebrities alike including the famed blonde bombshell Marilyn Monroe, who along with actors Tony Curtis and Jack Lemmon, filmed 1959’s ‘Some Like It Hot’ here. Find the lowest price and money-saying packages by purchasing tickets direct through our website. The Coronado Ferry Landing is among the most visited areas in Coronado.